A recent comment made by Aaron aka Prufrock made me realize that I hadn't posted anything on this blog for a few months. Although I haven't painted or gamed anything since the previous post, I believe it was rude for me not to have posted something about why this was. Particularly as I've always received such warm and thoughtful comments from all of you. 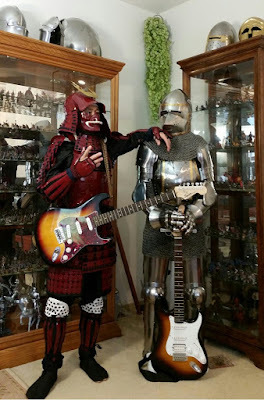 Anyway, I want to state for the record that I am doing well, but have pursued other interests - namely collecting (and wearing) armor, and more recently playing the guitar. In fact, I've sold off almost half of the figures I had - all to local gamers and friends, so I'll likely see the figures again in the future. Here's a picture of my two current interests. The two new hobbies - together for the photo, but not in practice.